Nick’s second release is a brand new recording of festive dance music. While he has released a Christmas CD before, namely “Merry Christmas Everyone” in 2006, this is the first time he’s recorded one which is also in-sequence. Coincidently, 2006 was also the last time he released any kind of sequence dance CD with “Stardust,” although there was 2007s quickly deleted double Hammond CD “Listen & Dance” (although only half of that was in-sequence). 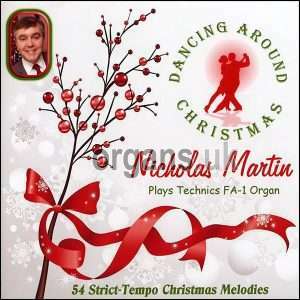 Prior to 2006 Nick released quite a few dance titles, but now that field is mainly left in the hands of the Maestro label artists with many of those recorded on Tyros 4 or 5 keyboards, so it’s good to see an organ one for a change. Of course, the tracks are recorded on his Technics FA-1, with the bonus of the Roland Fantom XR and “Theatre Organ In A Box” software on four of the tracks (slightly more than the usual quota). It’s also worth mentioning that this marks the sixtieth recording we have stocked by Nick (including DVDs). Highlights include the two bouncy quickstep medleys of “Deck the Halls” and “Santa Claus is Coming to Town” which will definitely get your toes tapping. The slower tracks of the theatre organ “Santo Natale” medley and “White Christmas” with its mix of theatre and Glenn Miller are very easy on the ear. “All I Want for Christmas” has a piano and percussive theatre organ sound and its good to see a lovely laid-back version of Wham’s “Last Christmas” on here. The CD closes with a sweet theatre organ arrangements of “Silent Night” and “The First Noel” and a piano/strings arrangement of “Sleigh Ride”. It shows how good Nick is on the timing side of things too as the drums are very quiet on most of the tracks (which is a nice change as most sequence CDs have them in the foreground) so the playing has to be bang-on, and it is. This also makes the slower pieces, including the waltzes, a lot more pleasing in non-dance situations. This won’t just be popular for Christmas dances, it will also appeal to the easy-listeners as you don’t notice you’re listening to a sequence CD until you hit a latin track where it is more apparent. With a running time of 75 minutes and not a duff-track in sight, it’s definitely one for the collection. Oh, and some allergy advice… This CD may contain sleigh bells. FULL TRACKS: [Quickstep] Deck the Halls / Here Comes Santa Claus / Snowcoach • [Quickstep] Santa Claus is Coming to Town / Jingle Bells / Let It Snow, Let It Snow, Let It Snow • [Waltz]* Santo Natale / Away in a Manger / Mistletoe and Wine • [Waltz] The Holly and the Ivy / Oh! Christmas Tree / Silver Bells • [Foxtrot] See Amid the Winter Snow / Little Donkey / Baby It’s Cold Outside • [Foxtrot] White Christmas • [Jive] Winter Wonderland / I Saw Mummy Kissing Santa Claus / Jingle Bell Rock • [Jive] Christmas Alphabet / Mary’s Boy Child • [Saunter] All I Want for Christmas (Is My Two Front Teeth) / It Came Upon a Midnight Clear / When a Child is Born • [Saunter]* I’ll Be Home for Christmas / It’s Beginning to Look a Lot Like Christmas • [Cha Cha] Good King Wenceslas / While Shepherds Watched Their Flocks / Calypso Carol • [Rhumba] Last Christmas / As the Deer (Pants for the Water) • [Rhumba] In the Bleak Mid-Winter / Walking in the Air • [Samba] Snowy White Snow and Jingle Bells / Frosty the Snowman • [Tango]* Oh Little Town of Bethlehem / All Through the Night / God Rest Ye Merry Gentlemen • [Tango] A Marshmallow World / I Wish it Could Be Christmas Every Day • [Gavotte] Chestnuts Roasting on an Open Fire / Have Yourself a Merry Little Christmas • [Mambo] Another Rock ’n’ Roll Christmas / Ding Dong Merrily On High / Rudolph the Red Nosed Reindeer • [Swing] The Skater’s Waltz • [Rhumba] A Winter’s Tale • [Quickstep] We Wish You a Merry Christmas / O Come All Ye Faithful / Once In Royal David’s City / Hark the Herald Angels Sing • [Waltz]* Silent Night / The First Noel • [Quickstep] Sleigh Ride (* TOiaB Tracks). This entry was posted in OKC Reviews and tagged cd, organ, review, technics.